My son and I played Civilization 5 today for the first time – Awsome! Today was a great day because my son wanted to play my favorite game of all time – Civilization (Civ). I began playing Civ 1 back in the 90’s and I have to say that it has impacted the way I understand history, strategy, and yes civilization. When I read Jared diamond‘s book, Guns, Germs, and Steel, I remember thinking “yes, that makes sense!” His thesis (location and resources matter) was confirmed by my experience in the simulation/game of Civ. Whenever I started in the Americas, I did not do so well, but when I started in Europe or Asia, I did much better. I have had a love/hate relationship with Civ. I love it because it is so compelling and I hate it because, at times, I enjoyed it too much. While in college, I remember limiting myself to only playing Civ during summer or winter breaks. I remember erasing the game and breaking the CD – only to buy the next new version a year later. I don’t feel so bad about Civ now – especially after all the research that I have read on the benefits of “moderate gaming”. I’m nearly finished with my doctorate in education, and I have decided to do my dissertation on the topic of games and learning. (Civ and “moderate gaming” have not damaged me too much.) In many ways, Civ has opened my mind to new ways of viewing the world. My son turned four in September, he loves playing games on his Ipad and he also loves riding his bike. I hope that he will continue to enjoy “moderate gaming” and every other good part of life. He is already learning geography, strategy, and so many other things in Civ. He really likes to fight the barbarians because, “they break things, and we are builders not breakers!” I was so happy he wanted to play Civ today! I named one of my cities after him – no one is going to take that city! 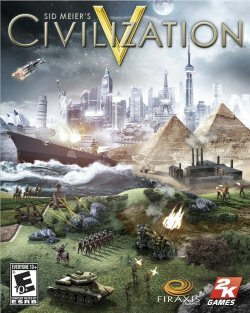 Posted on October 10, 2012, in Uncategorized and tagged Civ, Civilization 5, Games and Learning, Guns Germs and Steel, Jared Diamond, Strategy, video games. Bookmark the permalink. Leave a comment.